I was gifted a starter recently that was kept at 100% hydration and I have been maintaining it in that hydration -- mostly because its in a tall narrow jar and it is easier to pour it out. 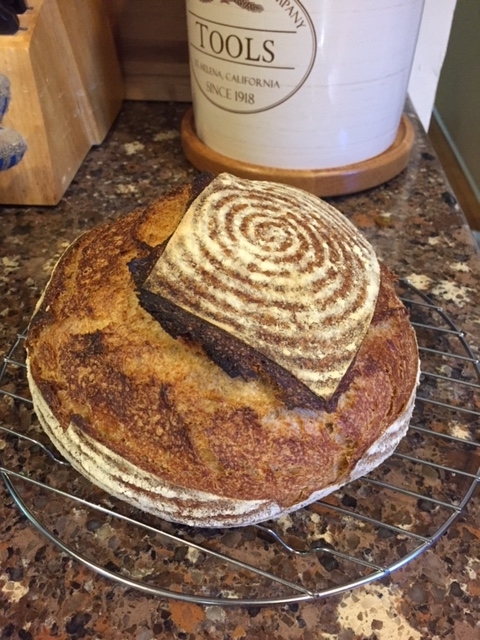 I always wanted to try the 1-2-3 formulation but was intimidated mostly by the fact that I had no idea how long to proof the dough and have always followed a recipe from either Tartine or FWSY. Well, this weekend I decided to take the plunge and used my newly acquired starter and made myself a loaf of bread from scratch. I also decided to use the stand mixer for the first time, just to up my baking versatility a bit. 125 grams starter (I eyeball it at 100% hydration), 250 grams water, 375 grams flour (150 grams whole wheat, 225 AP), and 7 grams of salt. 30 minutes rest with everything but the salt, added the salt and let the stand mixer's dough hook do the work for some period of time, maybe 10 minutes until it looked like dough. Then I did some stretch and folds over the next two hours before shaping and sticking it in the fridge. It did not rise any overnight, so I left it in a warm microwave for a couple more hours in the morning before baking. Came out very good. Nice tang, soft crumb and otherwise perfect. I had some two-week old dough sitting in the fridge -- enough to make a pizza (maybe 250 grams), and decided that I would add it to my bread dough. It stunk of beer and I was not sure what it would do. I regretted doing so almost immediately, as I did my first stretch and fold 10 minutes after incorporating it with the levain and salt. When I went to lift the dough my hand went right through the middle of it. It was like I created a super weak dough structure. Fortunately, by the second fold, the dough was much stronger and by the third, it started behaving just like my regular sourdough. At nearly the fourth hour, I pre-shaped, then shaped and stuck it in the 10" Bannetons and popped them in the fridge. I did not note how much whole grain there was in this formula. 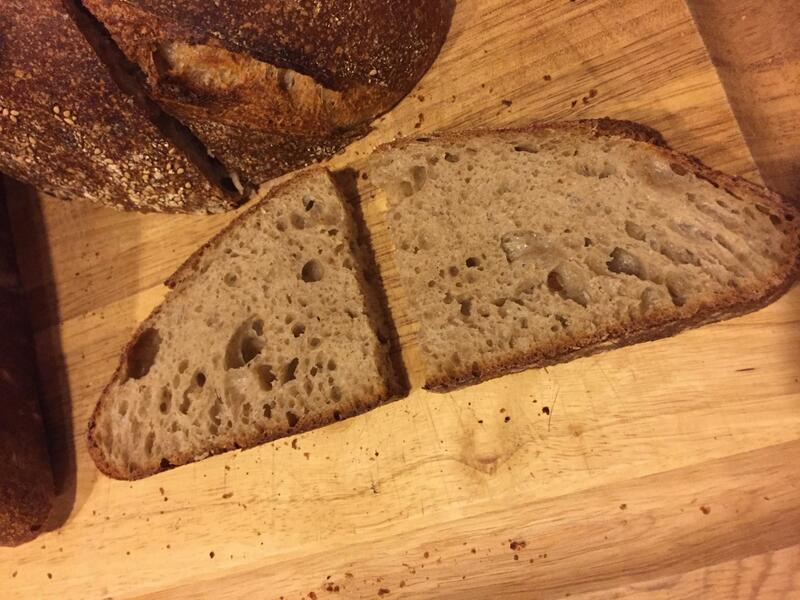 It was a random number based on the flours I had on hand. Though, I included about 10% rye. In the end, the bread came out very good. It smelled awesome and was something I was happy to eat and give away to my parents. 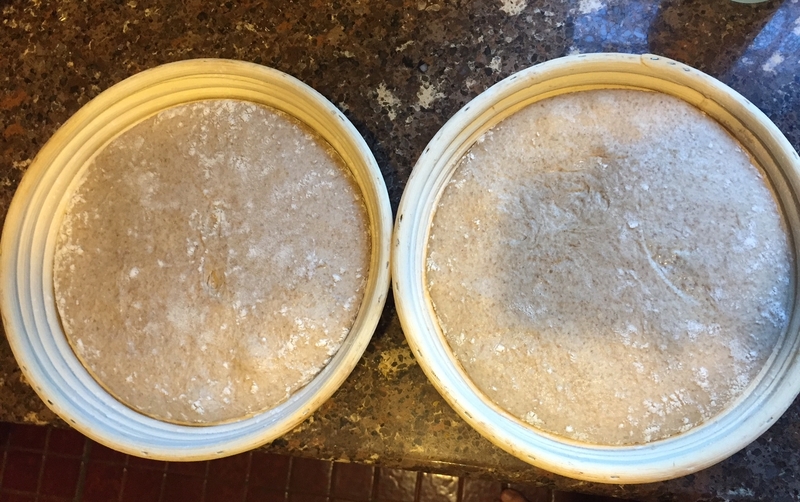 Here is the dough after an overnight stay in the fridge, sitting in a 10" banneton. And here are the final loaves. It has been a very long time since I baked a loaf without sourdough. In addition, this was a same day bake. I thought it was delicious. 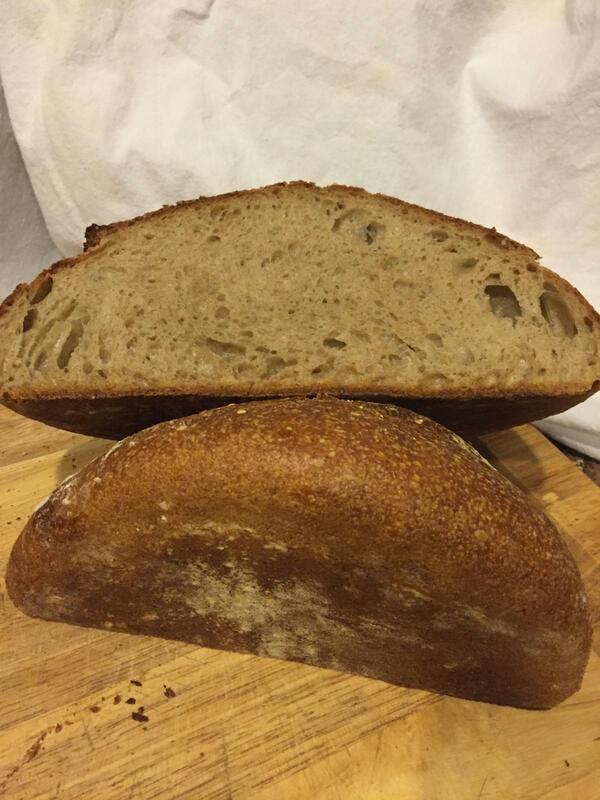 11% whole rye, 11% whole wheat. The funny thing is, my wife said right off the bat, "this bread is different than usual" I asked what she meant, and she said that my other breads have a sweeter flavor that she liked more. To be honest, I thought this bread was so good that I'd be happy to make it again. However, using a teaspoon of yeast gives me the heebie jeebies so I don't know that I will do it except when absolutely necessary. 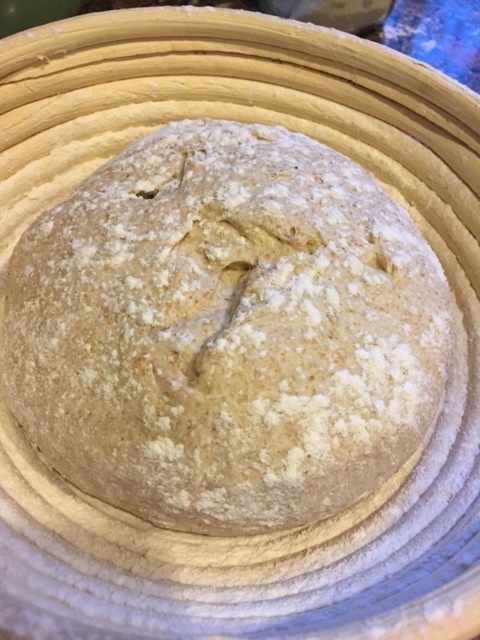 This weekend I baked a new loaf and as I did so, I marveled at how far along I have come as a bread baker -- at least when it comes to making the sourdough boule. I'm not going to lie... this is not matzoh. But, if it were, I would be very very wealthy. The formula is my own though I am certain others have made it before me. Here's a link to my blog. There are a bunch of pictures that may make you hungry. Trust me on this -- there may be many ways to make bread pudding, and you may have your favorite -- but this bread pudding is unbelievably delicious and unbelievably simple to make with only a few ingredients. The only thing I didn't measure was the cinnamon and the bread. Here, I used close to an entire boule, just tore it up into chunks. I used a combination of Saigon and Ceylon cinnamon. While making my sourdough I realized that I ran out of all purpose flour. And had only a smidgen of Rye berries left. Fortunately I had a quart of Kamut that served as a nice substitute. I did weigh everything to get to the 2000 grams of flour, but I didn't write down the formula. 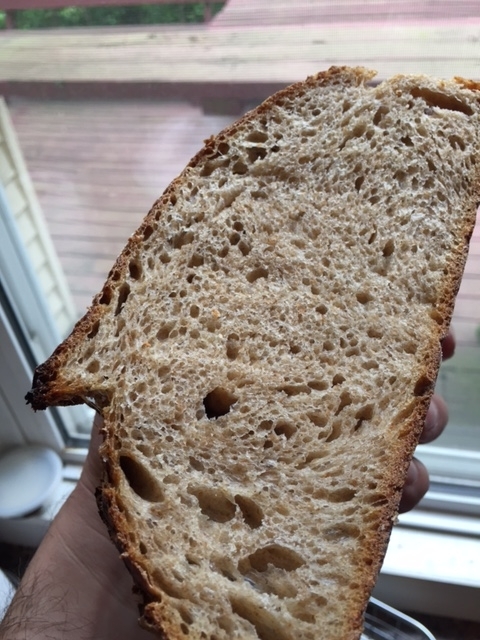 It has whatever a quart weighs of Kamut, whole white wheat, a bit of whole rye and all purpose flour in some unknown ratio. I love hummus and thought it was time to try my hand at pita. Using the recipe from serious eats, I met with great success. The formula called for more yeast than I like. I set the oven at a higher temperature (baked at 550 though I did not check the thermometer, I just baked shortly after it came up to temperature. The pitas were very soft. Made six of them. Ate two fresh out of the oven. Just cut them up and dipped them in homemade hummus. It was a real treat. I will try this with sourdough next and then with more whole grains. I may also try cooking on the stove top and see how that goes. This weekend I made some of my best loaves yet. 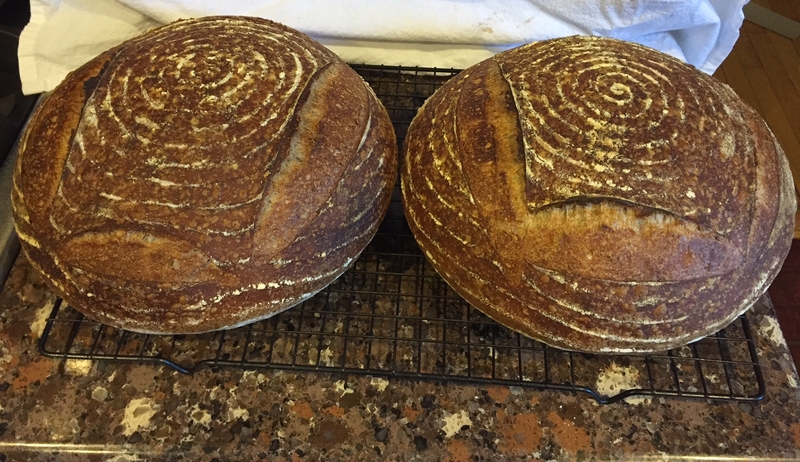 I actually made enough for four boules, and had proofed them and intended to bake all four, but something came up and I baked only 2. I stuck two in the fridge and baked them up the following morning. Those are the two that are pictured here. No crumb shot for these but I did eat from one of them. 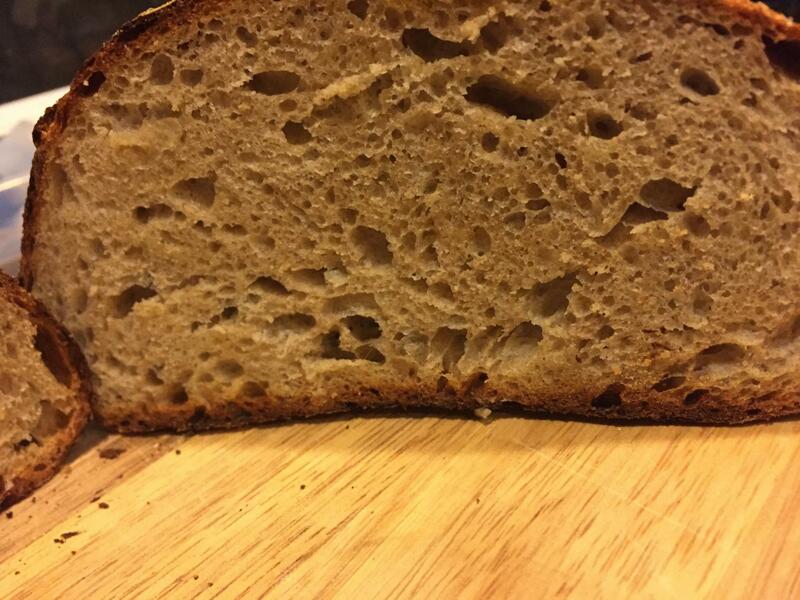 The verdict -- one of my best breads to date. 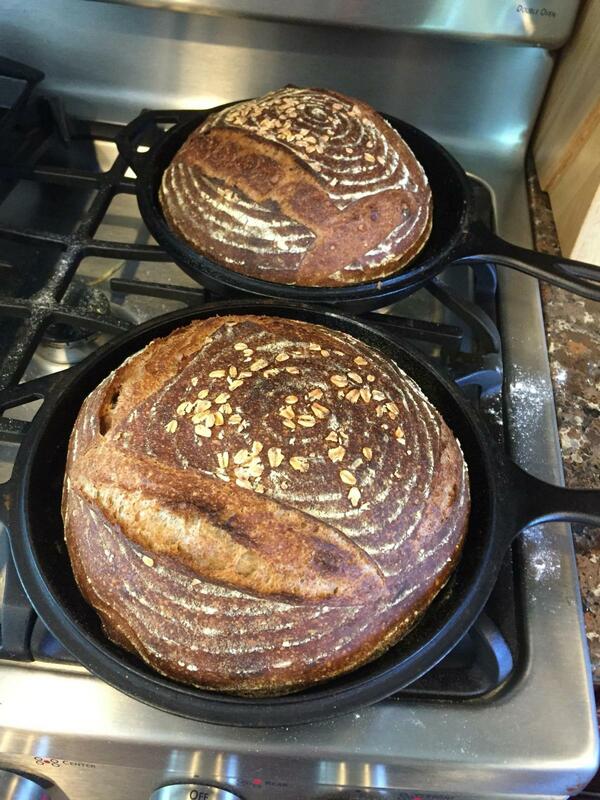 The loaves were 63.8% AP, 26.9% Whole Wheat and 9.3% Whole Rye. The reason for the odd numbers is simply that I used all of the milled wheat I had on hand, and for the rye berries I intended to weigh out an even number but wound up with 5 extra grams and then made up the difference with the All Purpose Flour (I was looking for 2000 grams of flour and wound up with 491 grams of whole wheat, 205 grams rye and 1304 grams of All Purpose, plus the flour in the levain). The crust,crumb and taste were outstanding in every way. In a large bowl, combine the milk, water, butter, salt and sugar. Add the dried milk, flours and yeast, stirring till the dough starts to leave the sides of the bowl. Transfer the dough to a lightly greased surface, oil your hands, and knead it for 5 to 8 minutes, or until it's smooth and supple. Transfer the dough to a lightly greased bowl, cover the bowl, and allow the dough to rise until puffy though not necessarily doubled in bulk, about 1 1/2 hours, depending on the warmth of your kitchen. Lightly grease a 13 x 4 USA Pan™ Pullman Loaf Pan. Transfer the risen dough to a lightly greased work surface, shape it into a 13-inch log, and fit it into the pan. Cover the pan with lightly greased plastic wrap, and allow the dough to rise until it's just below the lip of the pan, 45 minutes to 1 hour, depending on the warmth of your kitchen. Remove the plastic, and carefully place the cover on the pan, let it rest an additional 10 minutes while oven preheats to 350°F. Bake the bread for 25 minutes. Remove the pan from the oven, carefully remove the lid, and return the bread to the oven to bake for an additional 20 minutes, or until it tests done; an instant-read thermometer inserted into the center will register 190°F. Remove the bread from the oven, and turn it out of the pan onto a rack to cool completely. This is not my traditional bread, but it was fun and fast to make, and my wife loves the toast it makes. I tried a PB&J sandwich on it and was very pleased with how it came out. However, I can't say that it will be replacing my boule any time soon. It is simply not a remarkable bread. This is among my best tasting breads, alla Tartine. Levain was mixed Friday night using 1 tablespoon of starter from the fridge (last fed one week prior). Saturday morning, about 15 hours later, I mixed the levain with 700 grams of water, 700 grams AP flour, 205 grams whole wheat and 95 grams whole rye. Forty minutes or so later, I added 20 grams of salt and some extra water, enough to incorporate the salt into the dough, and enough to keep my hands from sticking. 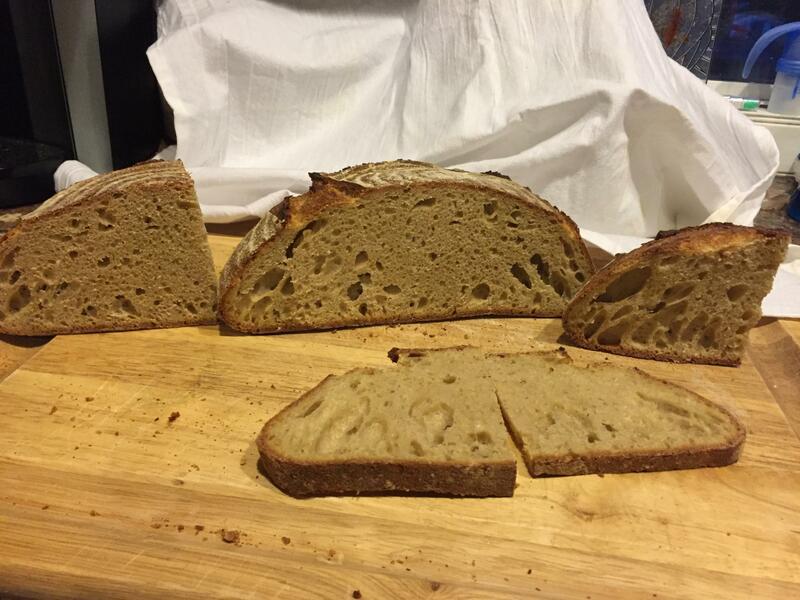 (Tartine suggests 50 gram but I find that to create a dough that is a bit too wet/pasty). The dough was very easy to handle, was not at all sticky, and I let it proof at room temperature (around 68 degrees) for 3 hours 45 minutes, in a basket (with a lint free towel rather than in the basket directly). Baked covered for 20 minutes at 450 (after preheating to 500) and uncovered for 25 minutes at 450.